Orton Rangers Under 13s are pictured before their 2-0 win over March Town Athletic. From the left they are, back, Paul Ambler, Ryan Hanks, Tony Thamickal, Dylan Ilett, Alex Driscoll, Aidan Palmer, Harry Benstead, Patrick Dooner, front, Ben Kolakowski, Alfie Holoran, Luke Rymiol, Luca Silveri, Max McLaughlin, Luca Ambler and Lewis Driscoll. Netherton United are the team to beat this season at Under 14 level. The city side made it a perfect five wins from five games on Sunday to stay top of the Junior Alliance League Division One table. Pictured are March Town Athletic Under 13s before a 2-0 defeat by Orton Rangers. From the left they are, back, Jago Pearson Hurrell, James Crowe, Charlie Howe, Ciaran O'Reilly, Jack Bamford, Luis Webb, Jack Bentinck, front, Aiden Gray, Caylen Wood, Sonny Wyse, Jake Jones, Cameron Raynor and Thomas Rowe. 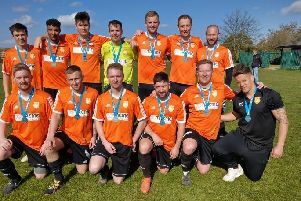 They overcame previously unbeaten One Touch Football 7-1 thanks to goals by Jakub Nowicki (2), Wayne Cort (2), Lukas Vaickelionis (2) and Bob Horne. Netherton Hawks are also going pretty well in Division Two. They jumped up into second place in the table - level on points with March Soccer School - after a 4-0 win at Spalding United Orange. Ruben Simoes (2), Zac Chaudhari and Kyle Brackley got the goals. In Under 13 Division One it’s still neck and neck in the race for the title between Feeder Soccer and Yaxley. Action from the Orton Rangers Under 13s v March Town Athletic match. Both sides made it five wins from five on Sunday . . . but only just. Goals by Ellis Mastin and Riley Taylor earned Feeder a 2-1 win at Boston while Yaxley were 1-0 winners at Park Farm Pumas Red. Orton Rangers are the new leaders of Under 13 Division Two. They knocked March Town Athletic off top spot, winning the big match of the day 2-0 through goals by Ryan Hanks-Bloss and Luke Rymill. At the other end of the table in this division, Peterborough Northern Star picked up their first win of the season. They beat March Soccer School 3-2 with Jayden Holman scoring all three of their goals. Bourne Town Red have gone top of Under 13 Division Three after a 4-0 win over Park Farm Pumas Blue thanks to goals by Eddy Coster, Rhys Crane (2) and Joe Haynes ,while in Under 13 Division Four table-topping FC Peterborough beat closest rivals Hungate Rovers 3-2. Biggest win of the day in the Junior Alliance League came in this sdivision as Long Sutton Athletic smashed Park Farm Pumas Black 11-1. Substitute Adam Crane led the rout with four goals and there was a hat-trick for Eljay Secker. The rest came from Jack Coleman (2), Bartosz Zbigniew and Harry Munson. In the Under 12 Lincs Cup there were wins for Deeping Claret, Spalding Blue, Holbeach Yellow and Pinchbeck. Harry Rippon hit a hat-trick for Deeping in their 4-0 win at home to Hykeham and Charlie Jarvis grabbed two for Pinchbeck in their 3-1 win over Discoveries. Stanground Sports Under 15s may still be searching for their first win in Division One of the Peterborough Youth League but there’s nothing wrong with their cup form. On Sunday they made the short trip to The Grange to take on Netherton United Hawks in the PFA Cup and stormed to a 14-4 victory. Ben Muchina was their main marksman with four goals and Joshua Borgognoni and Joshua Lovelock both hit hat-tricks. Completing the onslaught were Joshua Forman (2), Liam Killingray and Brandon White. Another player with his shooting boots on on Sunday was Lee Addison. He bagged a hat-trick for Pinchbeck Under 16s as they beat Division Three rivals March Park Rangers 6-2. Joe Bull (2) and Thomas Thorold got the others. Pinchbeck Under 18s also had a good day. They are joint top of Division Three with Netherton following a 2-1 win at Boston United courtesy of goals by Daniel Taylor and Jack Watson. In Under 18 Division Two, Jack Robinson helped himself to three goals as Oundle Town beat Hempsted United 4-0. Peter Beverly chipped in with the other one.